Google announced some new features that are being added to the Chrome browser on both the desktop and in the Android version of the browser. The update brings 3 simple but very useful features. You will be able to use these feature anytime, while using Chrome, so the experience should be rather smooth. 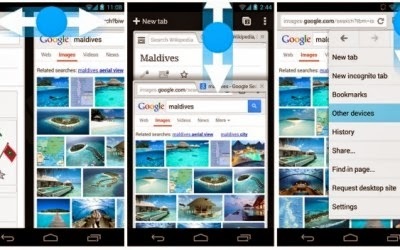 Swipe horizontally across the top toolbar to quickly switch tabs. Drag down from the menu to open the menu and select the item you want without having to lift your finger. Actually all these Chrome for Android features have been implemented in the Beta version for more than a month. As usual the Chrome update brings minor bug fixes and performance optimizations. You can check the full changelog in Chrome Browser for Android app page in Google Play Store.